System of politics in India has facilitated the rise of a number of political parties – in fact over 200 political parties are currently registered with the Election Commission. Infighting within the parties over personal differences has caused the proliferation of many splinter groups. This has also resulted in a number of independent candidates registering with the Election Commission. Indian voters have, in general, not supported independent candidates. Apart from siphoning votes that would otherwise go to a political party, independent candidates do not usually stand a chance of winning. In a situation like India’s where no party wins the majority vote, the role of independent candidates becomes crucial. They can join hands with the party with the maximum number of votes and form the winning coalition. Normally, the Independents candidate contest to seek election on the basis of their personal appeal or want to promote their ideology different than any party. Also some are those candidates who are sidelined by party political rivals within party but confident to make it or have motive to not allowing other candidates to get elected. Some contest genuinely and but few candidates are often criticized in India as being dummy candidates put forward by political parties to get around the spending ceiling imposed by the Election Commission. Independent candidates are sometimes also rebel candidates from a party contesting the election, who were unable to secure their party's nomination. 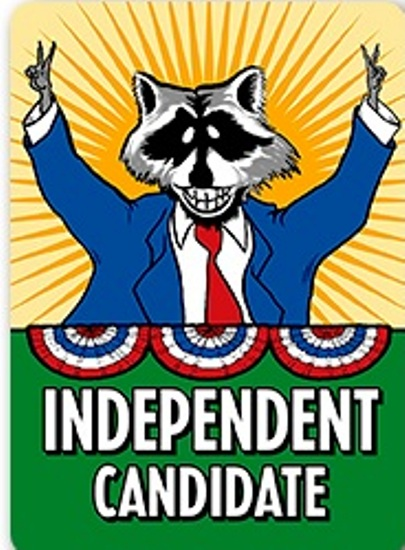 Dummy candidates running as independents that bear the same or a similar name to a party candidate have also been put forward by political parties to confuse voters. Independent politicians are not connected to a political party. But there has been a huge increase in the number independent candidates, mostly ordinary citizens, vying for seats in the house of law-makers at the state and central level is virtually a sign of growing frustration with the country's two biggest parties. The campaigning is sometime dangerous by the independent candidates in some particular constituency in certain parts of the country where politics are dominated by either Congress or BJP as campaign volunteers for independent candidates have been harassed and threatened by supporters from more established parties. Analysts say the rise of so many independent candidates is a sign of up-and-coming public frustration with the nation's two main parties, the ruling the Hindu-nationalist Bharatiya Janata Party or BJP and Congress Party led. Citizens have formed watchdog groups aimed at rooting out corrupt politicians. Others have formed their own political parties, fielding their own candidates. Third parties play a relevant role in politics. In the short run, voting for a third party is essentially useless. In the long run, third party voters will have a disproportionate influence on the course of the country. And not everyone is encouraged by the proliferation of independents running for office. While India's Prime Minister Manmohan Singh called them "spoilers." In the case the case of Punjab, Shiromani Akali Dal and Congress are the main contenders but with the entry of Aam Aadmi Party in Punjab during the last general elections, Punjab was represented with four seats and this time during the Assembly elections, it is going to be a triangular contest almost at all the seats. Where there is a contest between the two major two political parties, the candidate who files paper to contest elections, is also considered as the third party apart from the third political party in line to give a triangular, tough and testing party. Since the independent candidate, if elected has no standing and say even if the government is formed in alliance with other major political parties in queue, the aim behind their filing nomination and winning with their personal influence is to either establish his own identity in the political career for future elections or shake-hand with the majority party while forming the government to get a suitable berth. There had also been chances that after filing the papers to contest the elections as an independent candidate, the same are later on withdrawn on getting elected, on pursuing by any of the two political parties in fray either in favour or by accepting the handsome amount without bothering for image in the society and political circles. But many independent candidates have vowed that if elected they would not hand over their constituency to the highest bidder. It is said that a vote cast for an independent candidate is a vote wasted. On the other some says that India’s democracy is probably safer in the hands of independent candidates and candidates from hundreds of India’s smaller, regional parties. They feel more responsibility toward their constituency than their political party. Frankly speaking, Gone are the days when elections were contested with personal manipulation only but now you require a handsome amount in hand apart from loyal and dedicated supporters. So far as the independent candidates are concerned, they don’t want ever really expect to win but they want to influence the other parties. If they can get popular enough to get a good portion of votes, one of the two party candidates will start approaching them, to bargain to drop under certain under-table conditions even dropping their nomination in favour of the particular candidate. Taking into account the role of Independent candidates during 2012 elections in Punjab, there had been 1078 candidates – 985 male and 93 female, in fray, out of which the security of 817 candidates was forfeited and total expenditure involved is Rs.130 crore officially against Rs.70 crore in the last elections besides Rs.100 crore by the candidates which comes to Rs.1 crore per candidate approximately for117 candidates. So far as the independent candidates are concerned, against 418 candidates, the security of 405 was forfeited. With the political scenario changing fast in Punjab, the State will go to the Assembly polls in January 2017. While two major Opposition parties – SAD in alliance with BJP, Congress and this time with the presence of AAP, are on toes to feel the pulse of the voters but one thing is certain that the ruling SAD is facing nine years of anti-incumbency as the alliance party BJP has not been in good terms on certain issues. But, even then the independent candidates will not have any impact on any of the major political party as they are capable to form the government without the help of independent candidates.